Because of delays due to the dangerous weather earlier in the week the previously scheduled Friday 9 a.m. Divine Liturgy is cancelled. The next liturgy is Saturday’s 5 p.m. Vesper Liturgy. 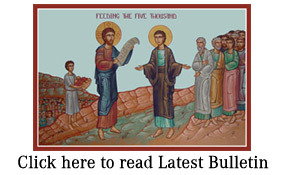 Then Sunday’s 9:45 3rd Hour followed by 10 a.m. Divine Liturgy. Please be safe and we all look forward to seeing you this weekend.